National security critically depends on space, and the Defense Advanced Research Projects Agency is focused today on creating the capabilities needed to help make that environment a real-time operational domain, DARPA Director Dr. Arati Prabhakar said here recently. Prabhakar spoke last week at the 4th annual Defense One Summit during a conversation with moderator Christopher Mims, technology columnist for the Wall Street Journal. “The questions we ask ourselves at DARPA about the space domain … is what would it take to make the space domain robust for everything that we need militarily and for intelligence, and what would it take to make space a real-time operational domain, which it's not at all today,” the director said, noting that many other nation-states now are active in orbit and space is a domain where conflict is becoming a real possibility. For DARPA space programs, a whole portfolio is needed, Prabhakar said, noting that there is no one magic solution to challenges in the space domain. “One dimension of it is launch, and some of the things that we're all seeing with commercial launch today is a great step in the right direction,” she said. “If you think of it in terms of time to launch -- how long does it take to put a new capability on orbit -- we've lived through a long time where the answer to that question was years. It's going to take billions of dollars and many years from the time we started to really put the asset into function,” the director added. Commercial capabilities may accelerate that to months, she said, but getting ready for launch -- having a certified process, all the safety and assurance, the facilities and the operational capability to launch -- is a long, slow process. “Because of the demands on launch, from the day you know you have to put an asset on orbit to the time you can plan on a launch today is still unacceptably long,” Prabhakar said. With that ambition in mind, DARPA is now starting Phase 2 of its Experimental Spaceplane, or XS-1. “We’re doing some amazing work with geo[synchronous]-robotics and rethinking [geostationary Earth orbit]-architectures once you have an asset that would allow you to extend the life or do inspection or simple repairs at GEO, which is something you can't do today. GEO is a stable region of space 22,370 miles from Earth. Because the orbital period matches almost exactly the time it takes for Earth to rotate on its axis in a day, objects in GEO seem to be hovering directly over one place on the planet, Pamela Melroy, deputy director of DARPA’s Tactical Technology Office and a former astronaut, said last year during a DARPA forum. And because GEO is a stable environment for machines -- but hostile for people because of high radiation levels -- DARPA thinks the key technology there is space robotics, Melroy said. DARPA’s Phoenix program seeks to enable GEO robotics servicing and asset life extension while developing new satellite architectures to reduce the cost of space-based systems. The program’s goal is to develop and demonstrate technologies that make it possible to inspect and robotically service cooperative space systems in GEO and to validate new satellite assembly architectures. Phoenix has achieved promising Phase 1 results and has awarded eight companies prime contracts for Phase 2 efforts. Phase 1 showed the feasibility of the agency’s robotic tools and assembly techniques, and validated the concept that new satellites could be built on orbit by physically aggregating “satlets” in space, according to DARPA. 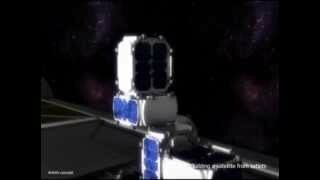 Satlets are small independent modules that can attach together to create a new low-cost, modular satellite architecture, DARPA says. Satlets incorporate essential satellite functionality -- power supplies, movement controls, sensors and others -- and share data, power and thermal management capabilities. DARPA now is working to validate the technical concept of satlets in LEO, DARPA says. In her remarks at the Defense One Summit, Prabhakar discussed what she called “big bets” that DARPA places in breakthrough technologies.